Emerald, like Aquamarine, is a variety of the mineral, beryl. Most Emeralds are mined in Brazil, Colombia and Zambia. Each locality lends variation in color ant clarity. 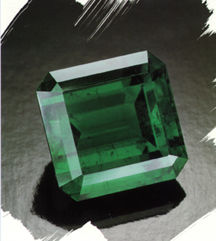 Remove your Emerald before engaging in activities such as sports, housework and gardening, as Emerald is sensitive to hard knocks and scratches. Never use an ultrasonic cleaner or subject your Emerald to harsh detergents. Emerald has long been regarded as an amulet of good fortune. Emerald is treasured as a gift for May birthdays and a talisman for the sign of Gemini.